Love Locket Bath Bomb | £6.95 // Since this was a lot more expensive than the normal bath bombs I wanted to get my monies worth so out came the hammer so I could crack it in two and use the heart inside for a third bath. I really liked the scent of this one, a mix of vanilla, jasmine and neroli. I think the actual bath bomb could have been a little bit more interesting as it simply turned my bath water pink but you can't ask for everything! 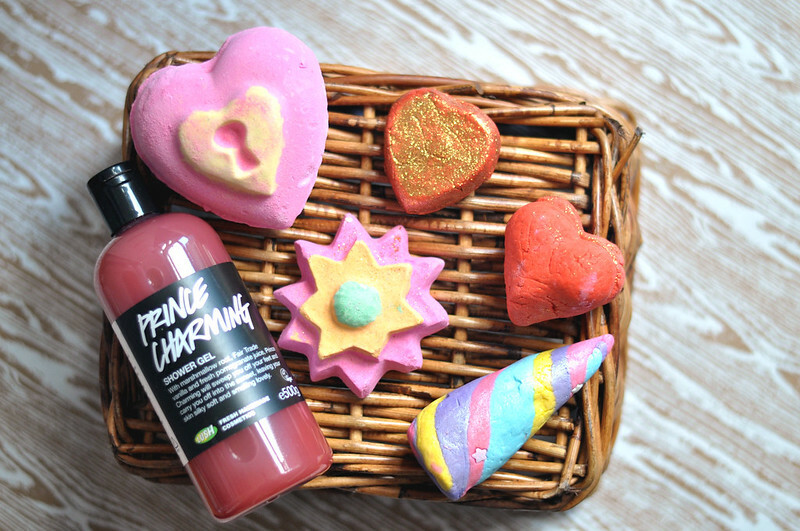 Prince Charming Shower Gel | £4.75 for 100g, £9.50 for 250g or £15.95 for 500g // With marshmallow root, Fair Trade vanilla and fresh pomegranate juice, Prince Charming will sweep you off your feet and carry you off into the sunset, leaving your skin silky soft and smelling lovely – the fragrance is made using a beautiful blend of grapefruit, sandalwood and geranium oils. This has been released before although this is the first time I've tried it. I find it a hard scent to describe so I thought the Lush description worked perfectly. It has such a more-ish scent that I just can't stop smelling! I went for the large size as whenever I bought the smaller limited edition shower gels I've always regretted it. Floating Flower Bath Bomb | £3.50 // This is one that I wish I had smelt first before I made my online order as I really didn't like it. The dominant scent is jasmine which I like in small doses but this was just too much. There is hints of ylang ylang and cypress but they're very subtle. The scent wasn't as strong once the bath bomb dissolved but it was still overwhelmingly jasmine. I really liked the effect this gave though once it was in the water as it really did look like a floating flower and fizzed away slowly leaving a trail of colours behind. Lonely Heart Bubble Bar | £3.50 // The colour red is for passion...and is said to make your heart beat a little faster! Despite being around the same price as the other bubble bars, this one is noticeably smaller than the rest. Normally I can get a good three or four baths out of each bubble bar but I only managed two with this one which was a bit disappointing. It would have been better if it was slightly cheaper or just a bit bigger. This has quite a zingy citrus scent from the lemongrass a long with bergamot, jasmine and ylang ylang. There's a slight powdery-ness to the scent which I don't really like, I think this comes from the rose absolute. Don't let the gold glitter covering this bubble bar put you off it though as you really don't notice it once you crumble it into running water, it just sort of turns into a slight shimmer in the water. I liked that this turned my bath water red but the bubbles didn't last the whole length of my bath. Heart Throb Bubble Bar | £3.65 // This has the same fragrance as the African Paradise body conditioner which I actually haven't tried but I do like the scent of. It has quite a subtle scent compared to the others but it's probably my favourite after Unicorn Horn. It's a mix of frangipani, shea butter, vanilla and geranium. Don't let the geranium put you off though as it isn't a strong floral scent, it's relaxing, warming and a bit spicy. Unicorn Horn Bubble Bar | £3.25 // This is my favourite out of the whole Valentines collection and I really hope Lush make it permanent. The strongest scent is lavender with a hint of neroli which I find so relaxing. This has the same scent as the Christmas Hedgehog Bubble Bar from the 2014 collection which I loved so happy to sort of have a second. It isn't what I expected just from looking at this bubble bar but I much prefer it to the sickly sweet scent I imagined it would have. So jealous! Every time I've gone in for the Unicorn Horn it's been sold out! I'm out of luck these days!